As most are aware, Nebuchadnezzar had a dream (Daniel 2) and he not only wanted his counselors to tell him what the dream meant, but also wanted them to tell him what he had dreamed! Only Daniel could do it and he was able to do it because God gave him the ability. He was quick to point out that he himself did not have the ability, but it came from God. The dream turned out to be of a statue that highlighted the various sections in different metals. Each metal represented a different empire and period of time. The head of the statue (gold) was Babylon. The chest and arms (silver) represented the Medo-Persians. The belly (bronze) pointed to the Grecian Empire. The legs (iron) represented Rome. The final empire – the feet and toes (clay and iron) represents the last Gentile empire that will exist just before Jesus returns physically. As I mentioned to the adults in attendance for my Daniel studies, it all sounds weird. Here we are in 2014 and we don’t think in terms of a world dictator anymore. While we know that there are dictators in the world today, the idea that there is someone who would have the power and ability to take over the entire world is something most have a hard time swallowing. Yet, this is what the Bible tells us will happen. In fact, I believe the world is moving toward that time right now, guiding by Satan as he works through the Global Elite – people he has placed in power and given them incredible wealth – in order that his will might be accomplished. Of course, it needs to be understood that Satan can only bring to fruition the things that God allows. We need to also understand that the coming world dictator cannot get to that place without a great deal of help. That help comes in the form of corrupt world leaders, bankers, and financiers who are working to bring the world to the point of collapse. Once this occurs, they know that people will cry out for help and will also be willing to give up more of their rights in exchange for some sense of security that governments will promise (but not necessarily fulfill). Many articles have been written on a coming collapse and a good deal of the emphasis is on what they believe is happening in the United States. It would appear that the powers that be (elected officials operating under instructions of the Global Elite) are creating a very untenable financial situation in America. If the current direction is continued, it will not be long before the U.S. dollar collapses and will be worth absolutely nothing. This is done by overextending our credit and that happens when our federal government continues to spend money it doesn’t have (usually by simply printing more of it). America stays afloat financially as long as other countries are willing to buy our debt. They buy our debt and in turn, America gains credit. That credit is used to simply buy more things. If a person (or business) lived like this (and many do), they eventually need the services of a bankruptcy attorney. The government is a different beast, but will still suffer from the same type of fate if it continues to push things beyond the ability to repay. Because the feds show no sign of slowing down with respect to spending money, then we can conclude that a complete financial failure will occur at some point in the future. It is simply a foregone conclusion that this catastrophic failure will be experienced with hyperinflation. Rather than discuss how to stop the inevitable, it’s probably better to highlight what things will look like following the financial crash and complete devaluation of the dollar. While we don’t know when it will happen, we can be assured that it will happen. People who are unwilling to face this truth will find themselves left in the lurch. Martial Law – it’s a foregone conclusion that in order to rein in the complete fear that people will feel, the government will enact Martial Law. Of course, what’s left of the Constitution will be swept aside. Unemployment – Severe unemployment will also be the result of the coming crash/hyperinflation. You think it’s hard to get a job now? Wait until severe hyperinflation kicks in. Travel – under Martial Law, travel will likely be restricted. It will be nominal at first, but then become more severe. The government has created this situation because it wants control. That means keeping tabs on where people can go. Theft of Money – the government will most likely begin confiscating money from your bank account. They have started doing this in parts of the EU. It could occur with the initiation of additional taxes or fines levied against an account holder, or simply by going in and taking it. Food Shortages – it goes without saying that food will become scarce and what is available will become very expensive to buy. The average person won’t be able to afford it. Riots will be the result. I previously wrote an article on the water shortage in California that shows no sign of letting up. Housing Shortage – an incredible number of people will lose their homes because banks will demand full payment and people will not be able to pay. These are only some of the things that will likely happen when the financial crisis (in the form of hyperinflation) hits. The government (along with banks) caused the problems ahead because they want to have more people dependent on them. All of this will lead America (and other countries) that much closer to the one world government depicted in Scripture. Most people won’t embrace a one-world government willingly, so they have to be coerced or forced. The external pressures of a collapsed economy and all that goes with it will work wonders for these holdouts. In spite of what we are seeing today and have seen for the past few decades, too many people refuse to believe what is obvious. Because of that, they have made no plans for the future. What have you done to prepare for what’s ahead? I’m sitting in the lobby of a hotel as I write this. I’m waiting for my wife to come out of the conference she’s in so we can go home. All around me are people who seem oblivious to the coming tragedies. They’re drinking, watching the Olympics, laughing and having a great time. They will be taken by complete surprise. Entry filed under: Religious - Christian - End Times, Religious - Christian - Prophecy, Religious - Christian - Theology. 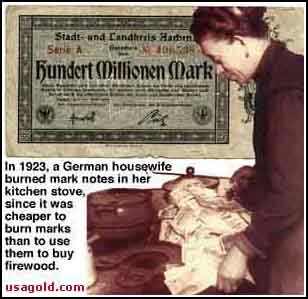 Tags: hyperinflation. Thanks for this insightful reminder.